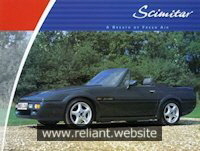 if you have any brochures for the Reliant Scimitar not detailed on this page or for those where scans are not present in the catalog then please click here. Notes: Version 1 is a single double sided specification sheet. Notes: Version 2 is an 8 page brochure. Notes: Notes: Version 1 is a single double sided specification sheet. 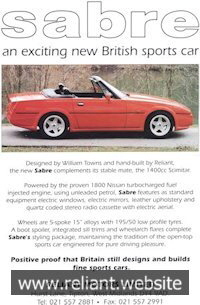 Notes: Version 1 is printed on thick card and on the back details the vehicle as the Scimitar 1400 along with stating the fuel type used is 97 octane. It also provides Reliant’s postal address in Tamworth. Notes: Version 1 is printed on thick card and on the back details the vehicle as the Scimitar 1800 Ti along with stating the fuel type used is 97 octane. It also provides Reliant’s postal address in Tamworth. 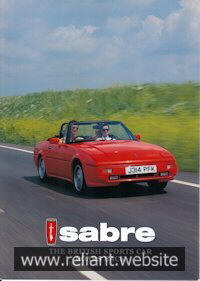 Notes: Version 2 is printed on paper and on the back details the vehicle as the Scimitar SST 1400 along with stating the fuel type used is Unleaded 95 RON or leaded 97 RON. It also provides Reliant’s postal address in Tipton, West Midlands. 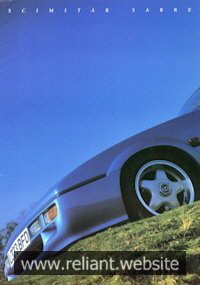 Notes: Version 2 is printed on paper and on the back details the vehicle as the Scimitar SST 1800 Ti along with stating the fuel type used is Unleaded 95 RON or leaded 97 RON. It also provides Reliant’s postal address in Tipton, West Midlands.